Dialogue Partners regularly works on complex, controversial projects that are embroiled with emotion and outrage. We design and facilitate processes and conversations that make space for this emotion and find meaningful opportunities to harness this energy and channel it into a positive, constructive discussion. I have been gifted with many opportunities over the last 10 years to learn how to engage in these types of situations, learn how to feel comfortable amid controversy and guide people through a conversation that results in building trust and capacity for the next time heckles get raised. So, it is on this premise that I decided to share a story about my less than perfect self because now, more than ever before, do I truly understand why the emotion has gotta come first. We shared in a past blog post about what happens when your “lizard brain kicks in.” It read, If your emotional response toward a person (or organization) is negative – because of perceived threat or assignment of negative intention or a lack of understanding or values conflict – then your reason will align with those negative feelings. It won’t matter what new facts and arguments the person or organization presents, you will be likely to see them as attempts to win you over or to persuade you of things that are untrue. In fact, the more the facts and arguments that are presented to sway your views, the more likely you will be to be certain of your view. If we completely ignore the emotion, pretend it’s not there, or hope that it will go away, we take away the opportunity to deal with the perceived threat or assignment of negative emotion. In this kind of situation ignorance is NOT bliss and not paying attention or engaging in the emotion or outrage will slowly erode the possibilities to build a positive relationship and find common ground. A group of 4 friends and their 5 kids are getting themselves started one early Saturday morning. The sun is shining, the lake is calm, and the day holds endless summer-fun promises. Unfortunately the kids are hungry and therefore grumpy, the parents are bleary-eyed from a lack of sleep and nobody has discussed or planned how the day will unfold. Needless to say, there is a lot of running around, confusion and a group of people who could do great things together but rather aren’t sharing what’s really going on for them. It is in this instant where I completely lose my cool and demand to my husband and friends that the board game is to be put away instantly so that breakfast can be prepared. My friend makes an offside remark about my “demanding” nature and how I should just “relax” and “take it easy.” He also suggested that they needed to finish playing now and couldn’t take down the board as they would lose their place in the game. When they are done, they will help out. This prompts me to storm out, almost break down in tears and feel furious as nobody understands how I feel and what is most important here. The day went on and we got through the morning, but it clouded the rest of our time together. After the weekend was over my husband and I had a chance to revisit the situation. We talked about what had happened and what we could have done differently to meet the needs of all parties involved. During this discussion we unpacked previous events and interactions with these friends (that I choose not to share in my story above) that contributed to the intensity of my feelings and compounded the situation. As soon as we finished our discussion it dawned on me that a possible solution might have been to request to move the board game to the second table inside. This would have allowed the players of the board game to maintain their positions for later and me to make breakfast. This is an incredible simple story and the better solution very obvious, reading it now it stills amazes me that I wasn’t able to propose this option in the moment. It was an incredibly powerful example of how even in a simple, non-controversial situation our emotion and outrage hamper our ability to reason and accept logic or possible solutions. It was only after our conversation about “what was going on for us” that we were able to devise solutions that met everyone’s needs. So, let’s investigate this example in a little more depth. Dialogue Partners regularly practices and designs conversations and engagements around a “values-based” discussion methodology. The idea is to “drill down” from the very narrow level of “positions” to establish a broad base of support for action that is based upon common ground or common interests. The chart below outlines the positions, interests and our shared values from my situation. What’s a position, what’s an interest, what’s a value? 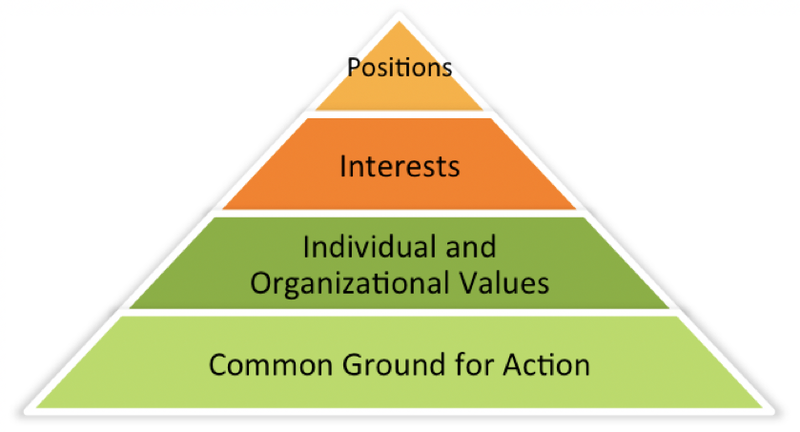 Positions: A position can be described as a posture, a point of view around an issue that is characterized as a proposed solution that the party thinks will satisfy her/his interests or needs - what each party initially wants as an outcome, or what they say they want. Such statements are often framed as black and white, yes or no statements, and are fixed, immovable views. Interests: can be described as WHAT someone cares about that influence the position they take. Often it is related to what they really want, although they may not state it directly. A parties' underlying reason for arriving at their positions includes their desires, concerns, fears. Interests may be tangible. Needs or Values: are they WHY and can be considered a requirement or necessity, and a value as something that is prized, important, has merit or is highly regarded. At the root of every interest and position, there is always a need or value. What can science tell us about emotion and positions? Let’s circle back to that idea of negative perception and assigning negative intention as it provides some insight to why we behave this way in situations as I’ve described. The study of social psychology has done much research into what is known as “attribution theory.” It can be described as “motivational theory looking at how the average person constructs the meaning of an event” or “how we make sense of their world; what cause and effect inferences (can we) make about the behaviors of others and of ourselves.” During the exchange about the use of the table, I felt my friend was being mean and insensitive. I was feeling attacked and that my needs were diminished and not as important as others. This created a negative perception and I attributed my friend’s intentions as hurtful and not in my best interest based on how I was feeling. Bad person, evil intentions…what a way to dig me into my position further. As I continued to feel threatened and pushed, the intensity of my emotion increased to a point where the only path forward I could see was my position and anything else would be sacrificing what was most important to me. Kinda silly for something so small…maybe…but I’m being honest and there’s a good chance if you thought back to some of your angry encounters you may come across a similar experience. 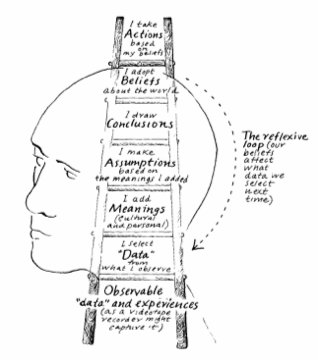 One more bit of psychology to help us understand the intersection between emotion and entrenching of positions is Chris Argyris’s work on the “The Ladder of Inference” can “help make our conscious or unconscious thinking patterns.” It shows how we gather information or experience a situation and then interpret through our own lens or view of the world. Here’s what the science tells us…the ladder suggests we rely heavily on our past life experience and observe what we have been accustomed to observing and fail to notice what doesn’t fit our past experience. SO what do I know now…? This picture suggests a leap of faith and I think that’s required each and every time you engage people in an emotional or controversial situation or issue. We don’t have all the answers, we certainly can’t know exactly what to expect and people will surprise you all the time. So here’s what I do know. The best way to find common ground is to have brave conversation. Reflecting on my experience, it’s become really clear that all we needed was brave conversation where the people impacted were able to share what mattered most, express what they were experiencing so that, TOGETHER we could look at the situation through a different set of eyes and come up with a solution that met the needs of both parties. There was an opportunity to go bigger than a compromise where everyone loses something or a “I’ll take the hit this time if you take it next time agreement” and instead find a solution that was grounded in our shared values. These are the kinds of conversations that build connection and deepen relationships. People can’t get past their positions until their mind AND HEART have felt acknowledged and heard. Really brave, meaningful conversations are grounded in the belief that as humans we not only think but we also feel. Thinking and feeling play equitably important roles in how we perceive, understand, connect and make decisions. So step in, dare to share – your emotion isn’t something you become but it does influence what you will experience and likely remember. None of us are perfect and we will occasionally not be our best self. But if we can see the conflict, emotion or outrage as a signal for a deeper conversation, we can take the first step in finding a process and solution that works for all. And an all-time favourite…You have to go through the trench to get to the other side. We know it would be so much easier if you could get from point A to point B in an easy, simple and manageable way. That just isn’t the case. The things that are emotional, passionate and really important are the ones we work hardest for, and the things that yield the best results. You have to immerse yourself in the emotion, in the complexity, sit in the chaos itself in order for the future to emerge. We know…this sounds like there might be hugging! There might be. It is messy and sometimes hard, and often uncomfortable but we’ve learned avoiding it only makes it worse and smoothing it over does the same. Embrace the fact you don’t know what to do. You’ll be amazed at what emerges from the chaos.